2014 is zooming by, and I can tell another month has come and gone because the mailman has brought me another Vegan Cuts Beauty Box! 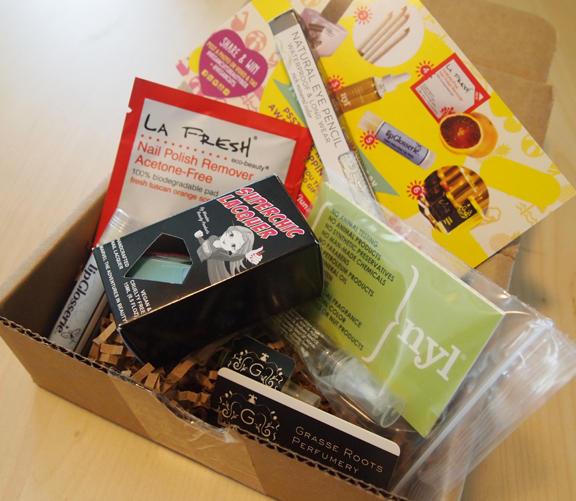 If you’re unfamiliar with the Vegan Cuts Beauty Box, let me introduce you! 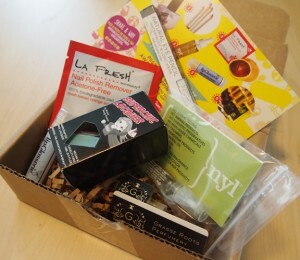 It’s a box full of 4 to 7 cruelty-free cosmetics and skin care samples that is sent to your door every month. Of course, as the name implies, the products are free of animal ingredients and are never tested on animals. Most of them are all natural and organic too, which means that they don’t contain toxic substances that are found in a lot of skin care products, such as parabens and petrolatum. The beauty box makes it easy for chic vegans to discover new brands without committing to full-size products or spending a lot of money. If you like what you’ve tried, you can purchase it’s full-sized counterpart from the Vegan Cuts Marketplace. The anticipation of opening a new Beauty Box and discovering the treasures inside is similar to that of opening a birthday present, and the June box just so happened to arrive on my birthday, making it an extra special treat. Superchic Nail Lacquer – Somehow over the course of 2014 I’ve become a nail polish junkie, and I love, love, LOVE this lacquer! The color I received was a shimmery sea foam green called Figment of My Reality, which looks awesome poking out from my summer sandals. It’s a light color and it took a few coats to cover my toenails, but it dried quickly between layers without any bubbling or smudging. I’m always disappointed when I discover a new nail polish brand only to discover that it chips or peels easily, and I’m happy to report that my Superchic Nail Lacquer has done neither. This pretty polish is not only cruelty-free, it’s free of toluene, formaldehyde, DBP and camphor. La Fresh Nail Polish Remover – With a nail polish obsession comes the need for nail polish remover. Most removers smell horrible and are extremely toxic. This little nail polish pad has a fresh orange scent, is biodegradable, and is free of nasty acetone. One pad cleans and conditions all 10 nails. I used this on my toenails (in order to get them ready for the Superchic Nail Lacquer), and I was skeptical about it being able to handle all 10 nails, but it did the job! My nails didn’t feel try and brittle the way they do after using conventional nail polish removers. Pacifica Eye Pencil – I received an eye pencil in Gun Metal – a shimmer grey color that’s versatile enough for both daytime and evening eyes. This richly-colored eye liner glides on smoothly and is both water proof and long lasting. Pacifica’s eye pencils are made with natural minerals and formulated to moisturize while providing color. These eye liners are made without carmine, talc, FD&C color, parabens and petrolatum. NYL Facial Serum – This nourishing facial serum was handpicked by Vegan Cuts co-founder Jill, and is one of her favorite discovers from last year. It’s formulated with a blend of high-quality natural plant oils, such as chardonnay grape seed oil and organic argan oil, that are know for their anti-aging and anti-inflammatory properties. This serum can be used on all skin types and leaves skin feeling nourished and moisturized. Lip Glosserie Lip Balm – I seem to have acquired a large collection of lip balms all of a sudden, but this Light Asian Pear Balm from Lip Glosserie has become one of my favorites. It glides on smoothly and has a fresh fruity flavor. It’s formulated with natural plant oils and butters and provides just a hint of shine. Grasse Roots Perfumery Perfume Oil – Quite a lot of colognes and perfumes give me a headache, so I was reluctant to give this a sniff. Fortunately I was headache free after applying this fruity scented oil. I received Blood Orange perfume oil, which is made with natural plant-botanicals and has a refreshing citrus scent. The Beauty Box is available as a monthly subscription, which means that a box of new goodies gets delivered to your door every month without an effort from you. If you like the samples in your box, you can order their full-sized counterpart from the Vegan Cuts Marketplace.